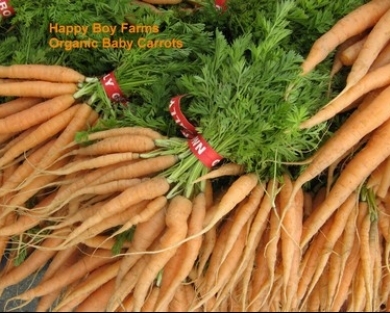 At Happy boy, we have our rock stars - the wildly popular seasonal crops like melons and heirloom tomatoes - as well as our unique specialty produce like edible flowers and padron peppers. 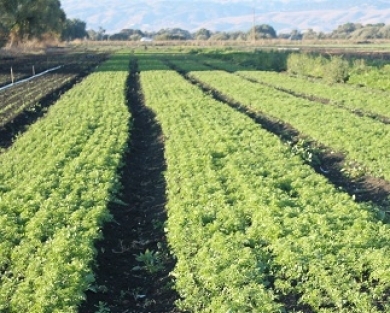 And then we have our few staple crops, always delicious and top quality, but veggies pretty widely grown and eaten in the area and not quite exciting enough to incite long-lines out the stand. Carrots, to me, always fell into this third category. Even working for Happy Boy I took them for granted, gladly munching on them in the stand from time to time or occasionally throwing them into my salads, but never giving them much thought. Since we can grow carrots pretty much year round, they are available at the stand rather consistently, minus the gaps that occur when we've sold all the harvested plants and the next planting out in the fields aren't quite ready. It took one of these especially long gaps to change my mind about carrots - in this case, absence not only made the heart grow fonder, but made me realize what many Happy Boy Carrot Enthusiasts have known for years. 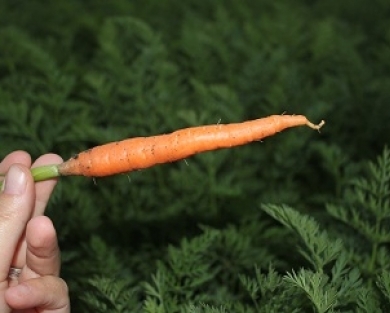 These little roots pack a flavor and crunch that is not only unmatched by other carrots out there, but pretty worthy of screaming hysterically over. After having this epiphany mid-carrot drought, when they did finally return I celebrated appropriately - by eating a truck-load of them. As I scarfed down each carrot, I contemplated their unique qualities: tender yet satisfyingly crunchy, sweetly flavored yet still complex and young enough that they didn't need to be peeled. I ate them raw, I chopped, grated, sliced and diced them, I sauteed them, juiced them, pickled them, added them to soups and even roasted them. The once-commonplace carrot is now more of a culinary adventure and an especially welcome sweet treat during the winter. Carrots are veggies highest in beta-carotene - it's also what makes them orange - and will make your skin slightly orange if you eat enough. They also contain high levels of healthy anti-oxidants.